The house on the cliff edge, sometimes referred to as “Spooky House” or even “Haunted House!” was built about 1885. The road leading to it was especially built to enable access to the house and was initially known as Seafield Road, later it became Merley Road. During the war years the house was the accommodation for British officers, and the field became a prison for the Italians. 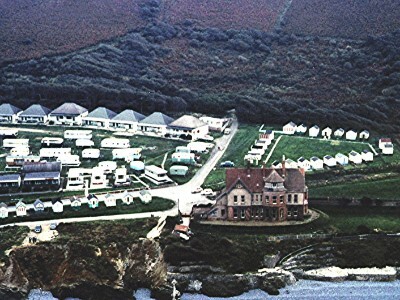 In the early 50’s the property was sold and became a Bed & Breakfast establishment. According to a family who stayed there in 1962 it was a very comfortable and child friendly home, the children being allowed to slide down the wonderful banisters. It remained a B & B for several years, but has since become a rather neglected and run down building. The house was built as a summer residence by Brinsley de Courcey Nixon (5 May 1825-18 April 1903), whose occupation was given on the 1881 census as a banker from London. Of Scottish and Irish descent he was born in Edinburgh and died in 1903 whilst on holiday at Seafield. The old Parish Register of Kirkcaldy Fife reads as follows: May 5 1825 was born in Edinburgh Brinsley De Courcey Nixon lawful son of Horatio Stopford Nixon, Lieutenant Royal Navy and Charlotte Fergus his spouse baptised by Rev. Dr. Murray. Minister of Auchterderran the 28th July following. Witnesses Walter Fergus Esq.Doctor Johnston of Kirkcaldy. Brinsley had been married twice, first married on 30th June 1864 in Co. 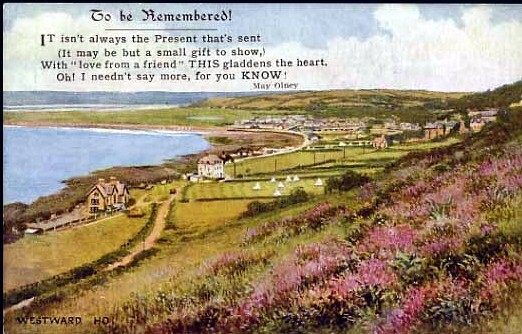 Limerick Ireland to Caroline Mary Gould (1830-1875). He married again on 6th October 1877 in Co Limerick Ireland to Frances Evelyn Hampton (born abt. 1830 in London). The following information is an extract from a Bristol Newspaper of October 14 1885. Brinsley was the son of Captain Horatio Stopford Nixon R.N. who married Miss Charlotte Fergus, she was a sister to Mr John Fergus who represented Fifeshire from 1847-1861. He was principally educated at private schools and afterwards the University of Edinburgh. Where in the year 1843 when quite a boy took second prize in the first mathematical class. It was intended that he should become a merchant and with that object in mind he entered the house of Messrs W.R. Robinson and Co, Russian Merchants, London, but because his interest was in studying other habits and customs and resources of European nations as well as the great American continent, considerable time was spent in travel. The Spectator describes Mr Nixon as an upright and straightforward Politician, ‘if ever there was one’. He stood as a Liberal, first at West Bristol but on the introduction of the Home Rule Bill he seceded from the Liberal Party and afterwards contested Dundee as a Unionist, but was unsuccessful in both campaigns. He joined British troops at Port Said and also as a spectator witnessed the Crimean War. His obituary in the Bideford Gazette of April 28 1903 records that the deceased gentleman whose unassuming manner and great kindness of heart had endeared him to a large circle of friends in the quiet way he did everything in his power for the common good, whilst philanthropic work seemed his delight. There were 2 girls and 2 boys born to Brinsley and Frances, Charlotte E, Gladys E, Fergus B, and Brinsley. Gladys (1880 – 1960) married Hugh Grosvenor (1880-1949) 2nd Baron of Stalbridge on 10 November 1903. Hugh was the son of Richard de Aquilla Grosvenor and Hon. Eleonor Francis Beatrice Hamilton Stubber. Gladys and Hugh had a son, Hugh Rauffe Grosvenor (17/8/1904-6/1/1930) who was an Aide de Camp to Patrick Hore-Ruthven in Australia. Although an experienced and skilled airman, he and his co-pilot were killed in a freak accident on their first practice flight over Port Phillip Bay, Victoria preparing for their flight to England via South Africa in a seaplane. The Grosvenors were the owners of Motcombe House in Dorset from 1825.The wealth of the family is undermined when Lord Stalbridge in 1904 agrees to honour his offer made 30 years previously to back a debt of £100,000 incurred by a fellow undergraduate at Trinity Cambridge and much of the estate is sold. In 1912 Baron Stalbridge dies and Hughie the eldest son inherits the title and Motcombe House, and in 1914 Hugh and Gladys together with their son move back there to live. He sells 2000 acres. In the period from 1925-1929 he sells the whole estate to the dismay of the rest of the family. The reason being that he feels the S and W Wilts Hunt is not good enough! He becomes Master of the Fernie Hunt in Leicestershire and Northamptonshire. Motcombe later becomes a school. Fergus Brinsley was a Leiut.in the Enniskillan Dragoons; later becoming a Major with medals awarded 31 May 1918. He married Maude Frederica Lascelles daughter of Commander Hon.Frederick Lascelles and Frederica Maria Liddell on 1 August 1912. Harewood House in Yorkshire was the home of the Lascalles family. The youngest son Brinsley spent some time in the South of Russia and it was here that he most probably met his future wife, Elizabeth Hughes the daughter of Arthur Hughes a Welsh multi- millionaire, who made his money in the Ukraine, his father, John Hughes (1815-1889) had a town named after him, Hughsofka. Arthur Hughes (1852-1917) married Augusta James (1853-1942). Rumour also says that Arthur had a ‘wife and family’in the Ukraine, but no records have been found to prove this rumour. 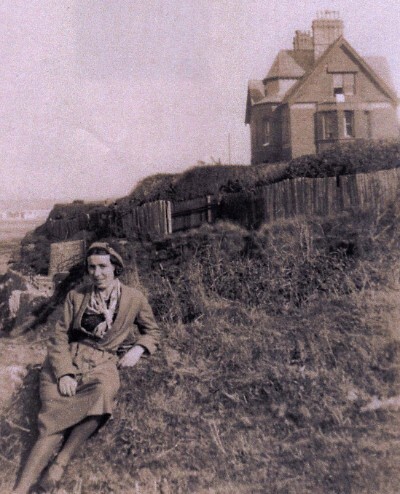 Elizabeth was born in Ukraine and spent much of her childhood in Russia, returning to England about 1917.On marrying Brinsley, Elizabeth lived at Seafield with her maid called Tyler, and her Russian friends came to visit often. Brinsley apparently lived most of the time with his sister in Bay View Road and visited Seafield once a week. Barbara Bizzell lived for some time at Seafield with Mrs Nixon, Barbara’s father being a Handyman for the family, her recollections are of a very happy family and she remembers the many visits by the Russian friends. Mr Bizzell painted the house for Elizabeth and she was so impressed that they became good friends, and he was often asked to sit with her and tell her stories about his naval days. The Bizzells were at the house for about 5 years and Barbara remembers that Brinsley or ‘Beano’ as he was known was a short man who looked much like ‘Punch’ the magazine character. Elizabeth was a shortish delightful lady. Barbara also remembers that there was one room which had two baths in it, a maids sitting room, a butlers pantry and cellar underneath, a large sitting room, a dining room and all the usual other rooms. 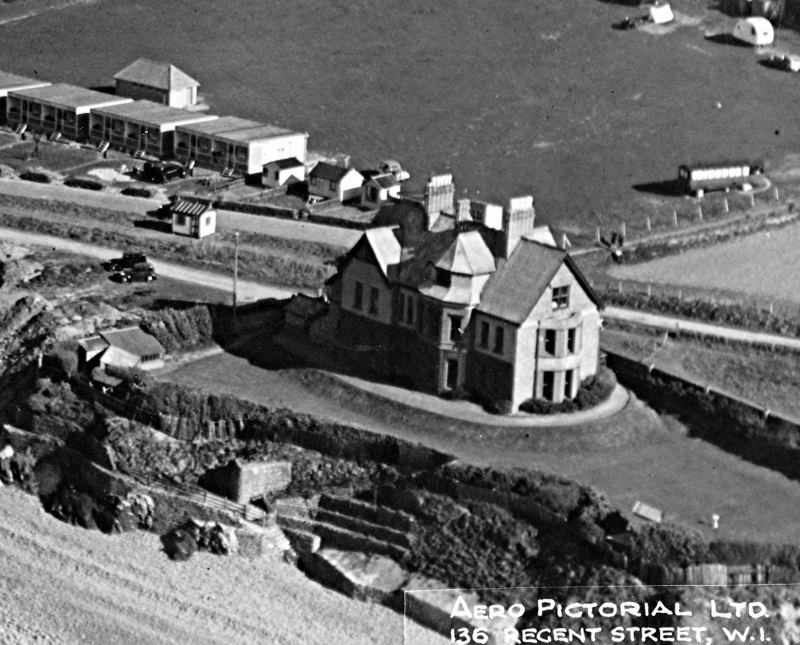 The house had its own private steps down to the beach where the family would sunbathe and swim. Elizabeth was quite horrified during the war when the Army requisitioned Seafield and painted it grey. She would walk from Diddywell each day to see the house. When the Army left there were many maps still on the walls, but it was not long before Elizabeth had it all repainted. Brinsley and Elizabeth had three daughters, twins Nina (1907-1966), Nancy (1907-1980) and Lorna. Nina first married Patrick Mills and they had 2 daughters, the Hon Sarah Patricia Mills and the Hon.Jenifer Mills.She secondly married Jonkbeer.Jan Reuchlin. Nina married Sir Alexander Glen and had one son, Adrian Glen (1942-1983). Lorna married John Munroe and moved to Canada. On March 13th 1950 Elizabeth died. The service was held at the Holy Trinity Church, Westward Ho! and conducted by the vicar of Northam (Rev.E.B.Bridger). A private cremation was held at Plymouth. Brinsley was unable to attend the funeral. May 31 1950, but was later sold by Private Treaty. The story has gone full circle, Seafield now becomes the much loved and visited Bed and Breakfast family home. The above by Maureen Richards in 2005 with acknowledgement to Barbara Lyall nee Bizzell. Dr David Probert (the Russian connection) and others. By the 21st Century the house was becoming more and more neglected, but it still exudes an aura of interest and mystery. It was the sole residence of an elderly lady ‘Jean’ after her brother died until late 2015 when she moved to residential care. The house was slowly cleared out and tidied up with some of the furniture and items being sold at auction. 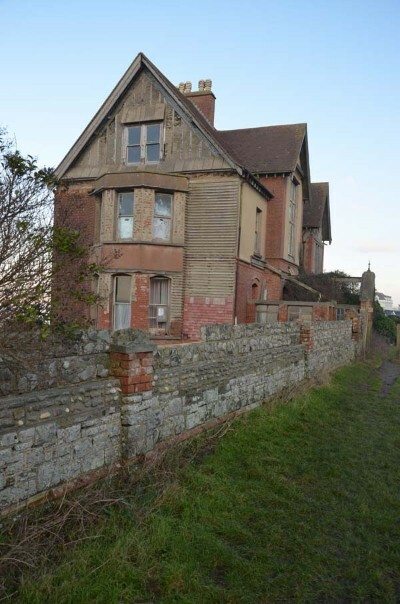 Currently [March 2016] the house is waiting to be sold, with everyone wondering if it will be restored to its former glory or sadly razed to the ground and replaced….. time will tell, but the story of Seafield House is not yet over. 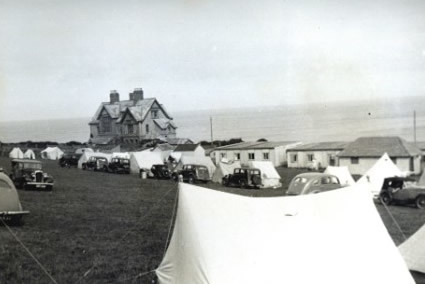 NIXON- on March 13 1950 at SEAFIELD Westward Ho!, Lesa wife of Brinsley Nixon daughter of the late Arthur Hughes and beloved mother of Nina, Nancy, and Lorna. Service at Westward Ho! today Friday at 10.a.m Cremation-Private. NIXON- the family of the Late Mrs Brinsley Nixon thank all her friends for their kindness shown to them in their bereavement, also for letters and flowers. N Rieuchlin. By order of the Midland Bank Executor and Trustee Co. Ltd Westward Ho! North Devon. 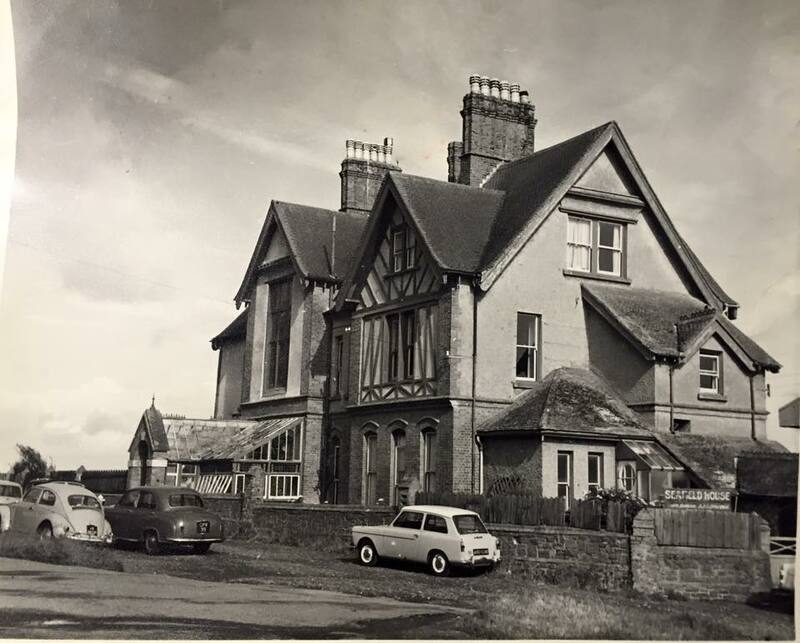 R.Blackmore & Sons have received instruction to sell by auction (unless previously disposed of by Private Treaty) at Tantons Hotel Bideford on Wednesday 31 May 1950 at 3.30 p.m.- the Freehold substantially built detached Marine residence known as and being “SEAFIELD” Westward Ho! North Devon. The property occupies a good position almost on the beach, and commanding extensive and uninterrupted views over the whole of the Bay, the Beach and the surrounding hills. A few minutes walk from the Bus Terminus, Shops, Church, Park etc and about 3 ½ miles from Bideford. The Residence is substantially built of brick and stone with tile roof and is detached. Servants Hall, 2 W.C’s, Back entrance Hall, Store Cupboard.Extensive Cellerage under. First Floor. 2 Large Bedrooms each with circular bay , Dressing room or Single Bedroom, 2 other Double Bedrooms 2 Bathrooms(one with basin h&c) separate W.C.
Second floor. Landing store and Linen cupboard. 5 good Bedrooms. Tank room. Mains Water and drainage electricity installed throughout/H&C Water Service.Gas Mains available. The outbuildings comprise- Garage,Potting Shed,Coal and Wood Stores Greenhouse,Fowl House,Lawn and Flower Garden,Vegetable Garden,Private Path and Steps to Beach Rock Bathing Pool. The rateable value is £62 per annum. Vacancy possession will be given on completion of the purchase. For further particulars apply to the Auctioneers Bideford with whom appointments for view must be made. Messrs Seldon Ward and Nuttall Solicitors and Notary, Bideford. The content on this site has been gratefully obtained from a number of sources, both written and verbal. The photographs and images have been sourced from many places. It's all as accurate as the contributors can make it, please contact us of there are any issues. The community and friends of Westward Ho! thank everyone for their help with this project.